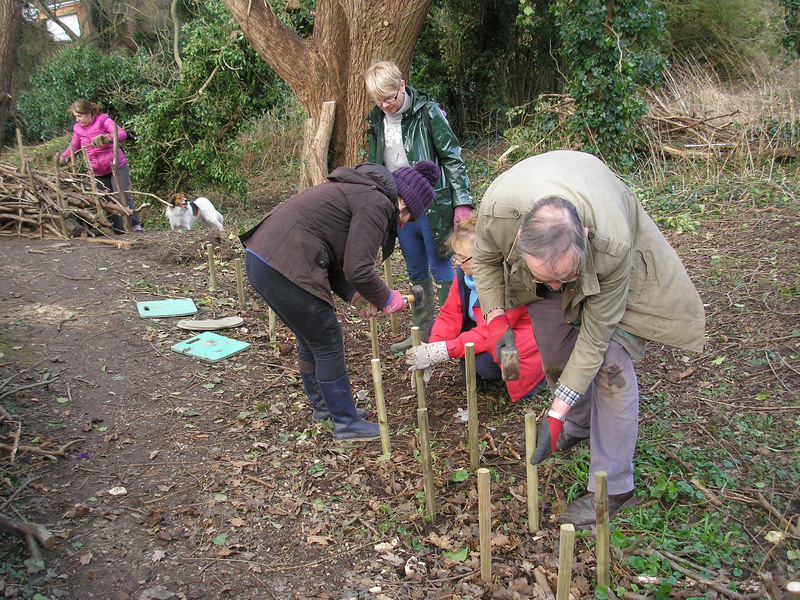 At our last Sunday session on Feb. 28th, six MCT volunteers created a new section of mini dead hedge to make the site safer and reduce trampling on the primroses and emerging English bluebells. We hope you like it. Cyclists have made a real mess of the grass near the MCT information board near Little Hob Moor by taking short cuts to the rear path. 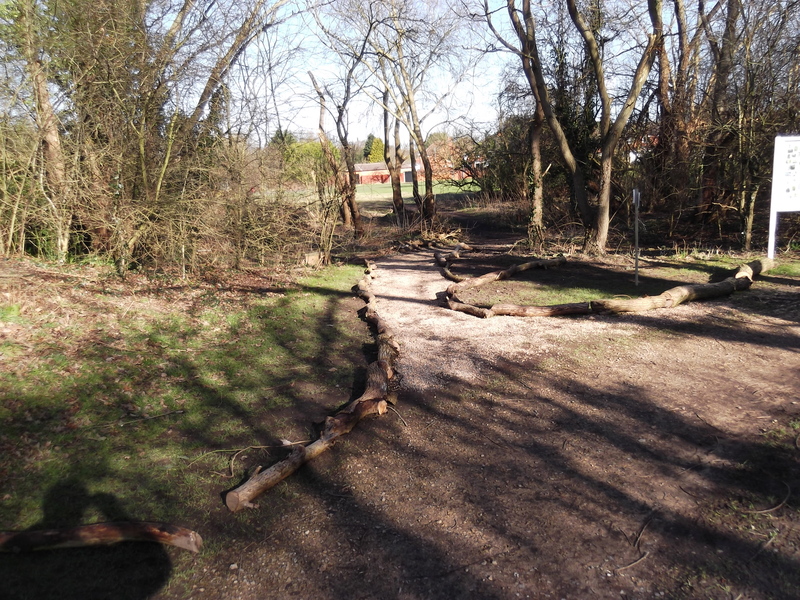 We have put in log barriers to protect the grass while we try to restore it and to guide them to a narrower path by creating an obvious junction as shown below. The problem’s been bad this year because of the prolonged wet periods. 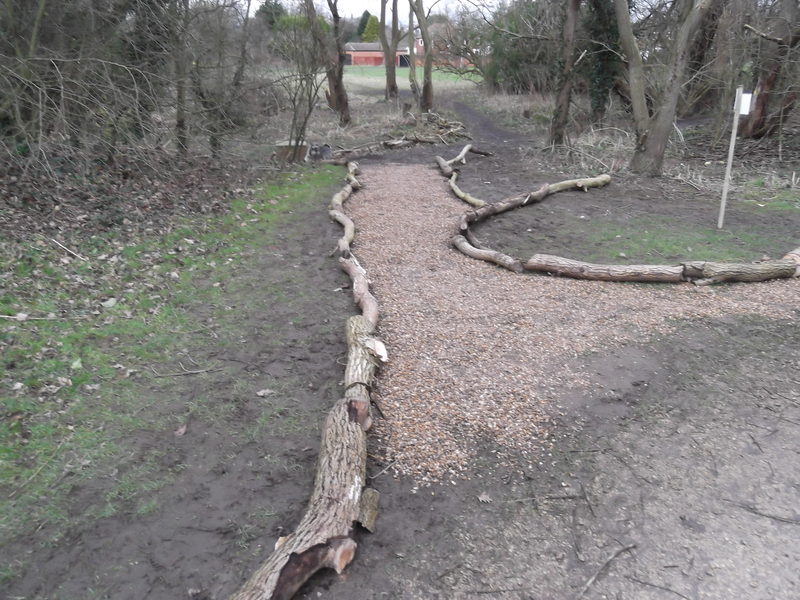 Applying 12 bags of gravel has made the area less slippery for the time being, so safer for walkers. After a meeting of a group of Trustees and Volunteers on Valentine’s day we decided where to install the second bench funded by the Dringhouses & Woodthorpe Ward Committee. 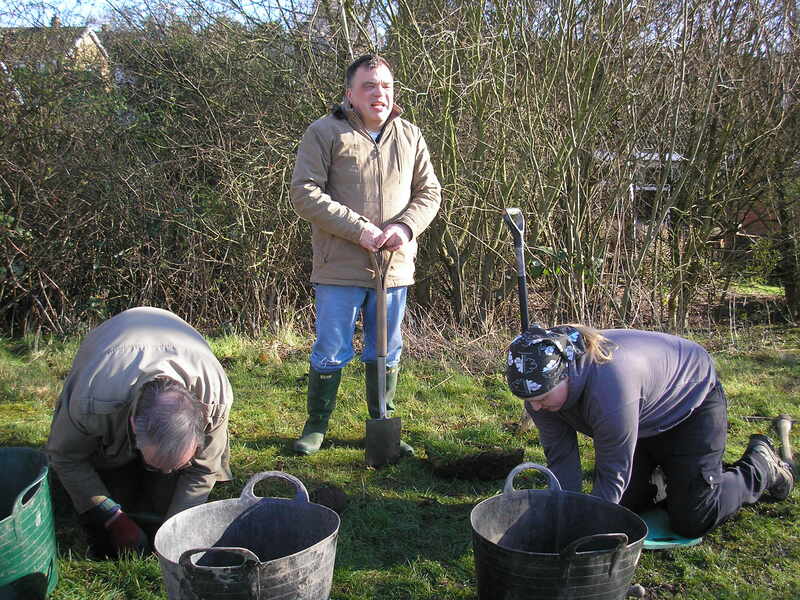 Pam’s photo (below) shows Malcolm, Paul and Adam hard at work digging out half a metre depth of soil to house the concreted-in bench legs. 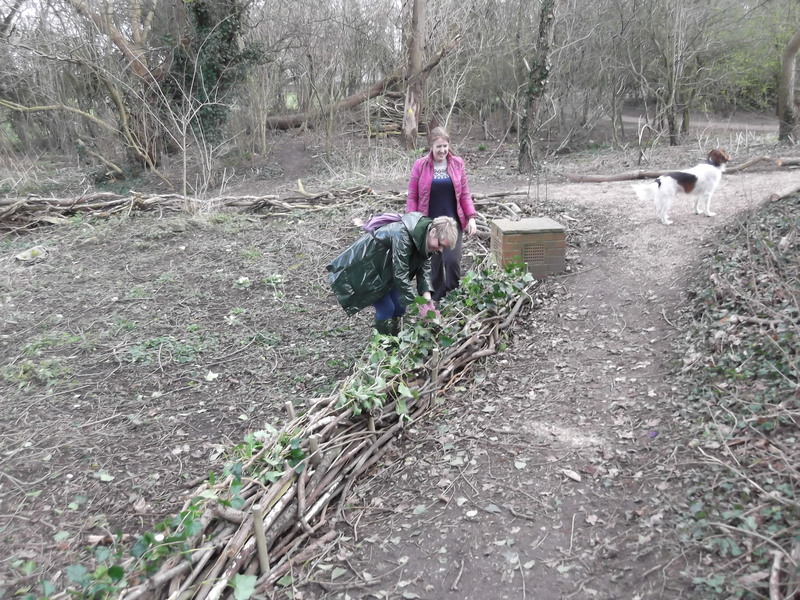 Meanwhile Jacqui, Lee, Louise and Lesley were working on the dead hedge at the north end of the site before coming to help with the installation. We were delighted to welcome Lee to our volunteer session. 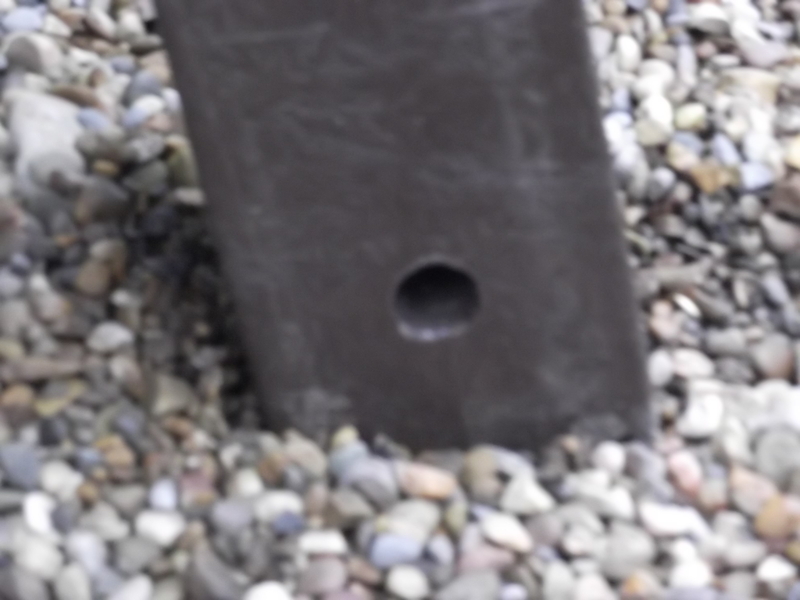 You can see a short video of how the installation is done on our Facebook page. 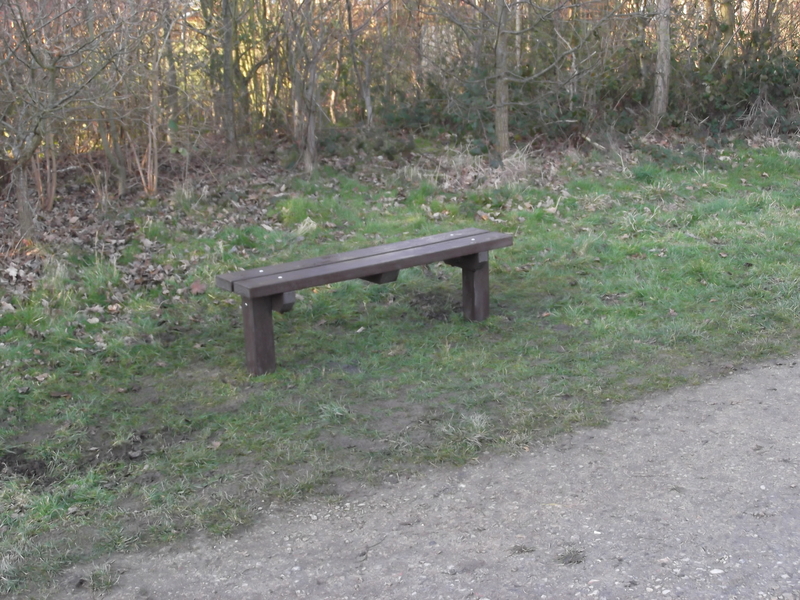 Sally Flint, one of the MCT Trustees, suggested it would be really nice to have a similar bench at the north end of the site near the notice board at the Little Hob Moor end. It’s an excellent idea as it would provide a beautiful longer-distance view of the beautiful wooded and grassland landscape MCT is carefully developing. It’s nice as spring approaches to start getting ready for the new season. 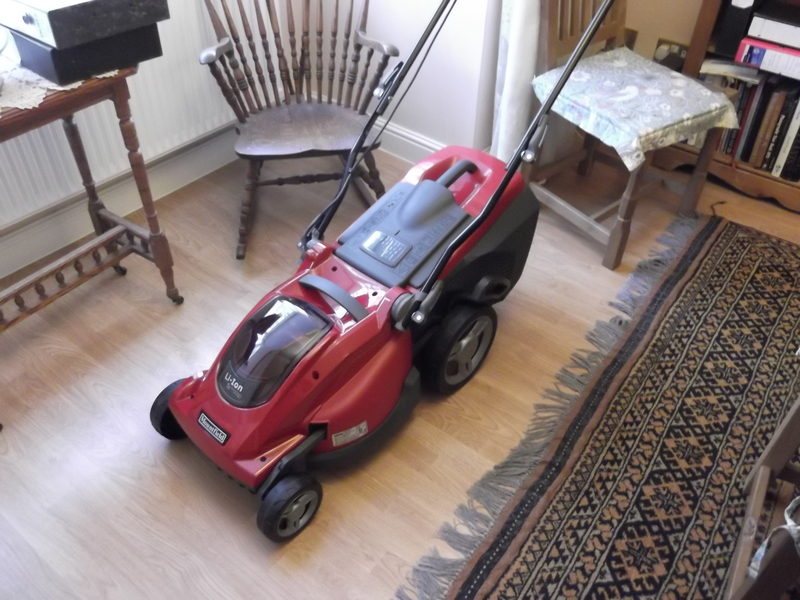 Over the past few days MCT took delivery of a new 48-volt battery mower with spare battery, kindly funded by the Dringhouses & Woodthorpe Ward Committee and a donation from Nadine Dixon. 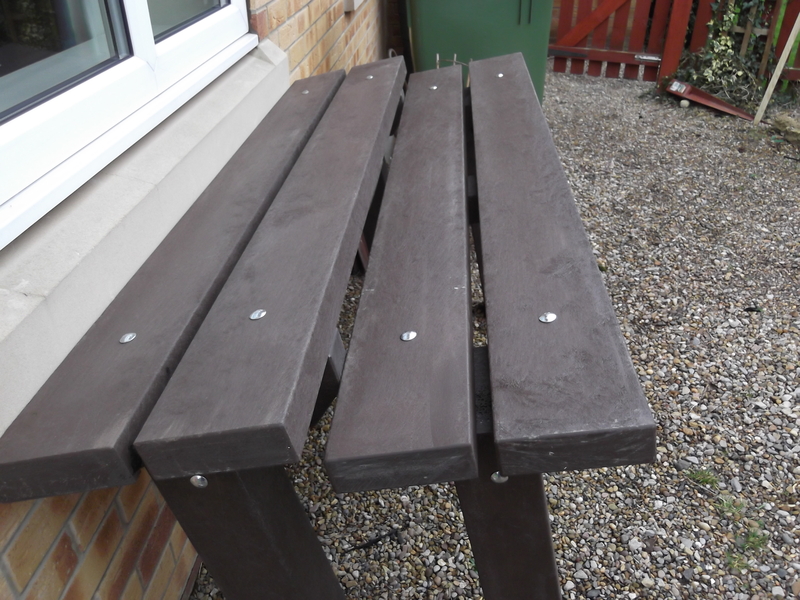 The Ward Committee are also funding two benches that arrived today too. We’ll soon be digging the holes to set them in concrete, after adding metal rods at the base for added security. They’ll be located to look over the wild flower meadow. Photos below show the MCT Sunday volunteer activity worked well. 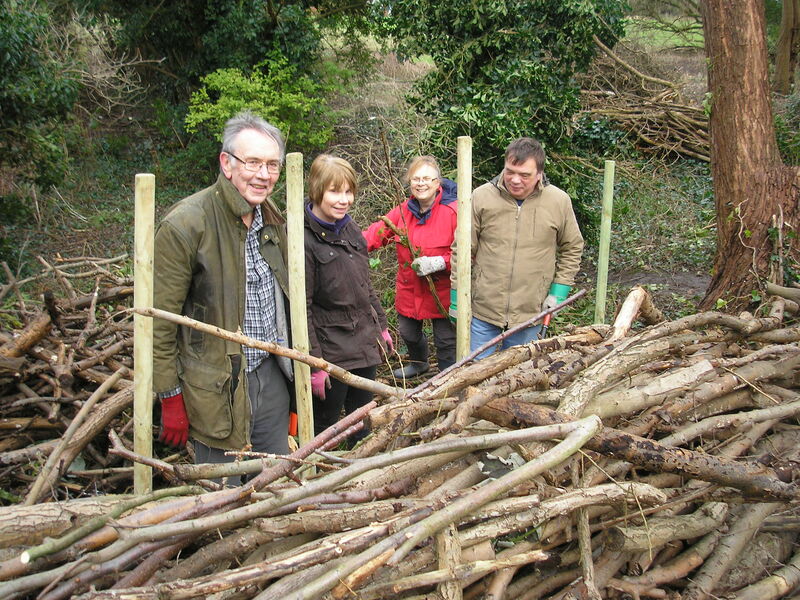 Pam Brown caught Lesley, Paul, Louise and Malcolm on camera at a very early stage by marker posts behind the old wood pile She also helped with shifting lots of wood. The second photo was at 16.30, so it was a longish day but we wanted it to be safe and quite neat before we left. We’ll soon be planting in front of it (small shrubs and wild flowers). 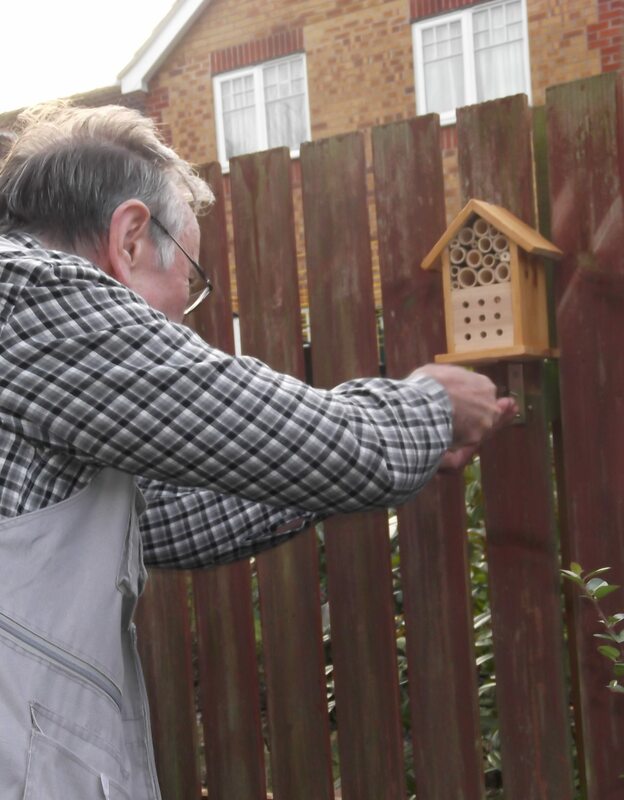 Our regular Sunday morning volunteer sessions start up again on 7th February at 10.30. We plan to extend the dead hedge at the north end of the west bund, so do come and help if you’d like to and have an hour or so to spare. 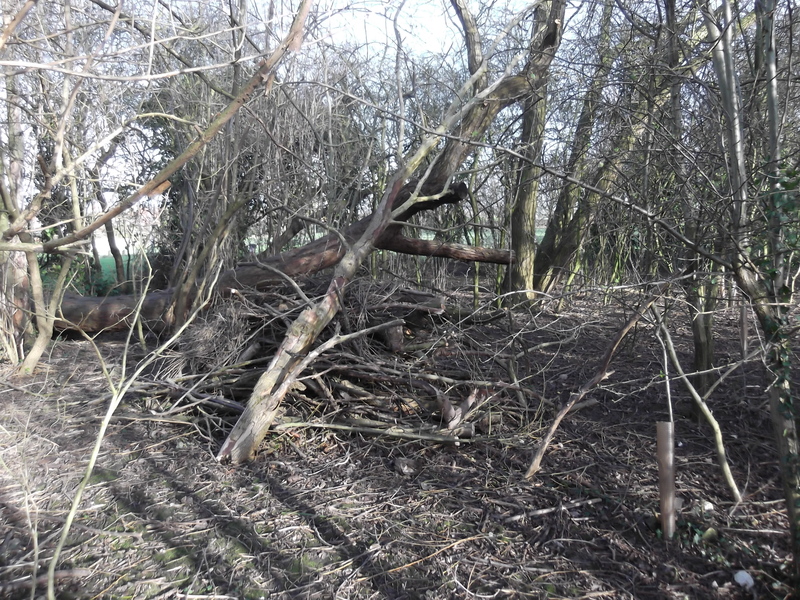 High wind on February 1st conveniently reduced the height of a dead tree on the edge of the site managed by MCT. The local tree warden, Ian Tomlinson, and the MCT field work co-ordinator had been watching the tree for several months, but it was left standing as an invertebrate habitat much loved by local woodpeckers. As the top fell in the night it was “caught” by an adjacent live willow, so it obligingly slid safely on to one of Ian’s habitat wood piles. 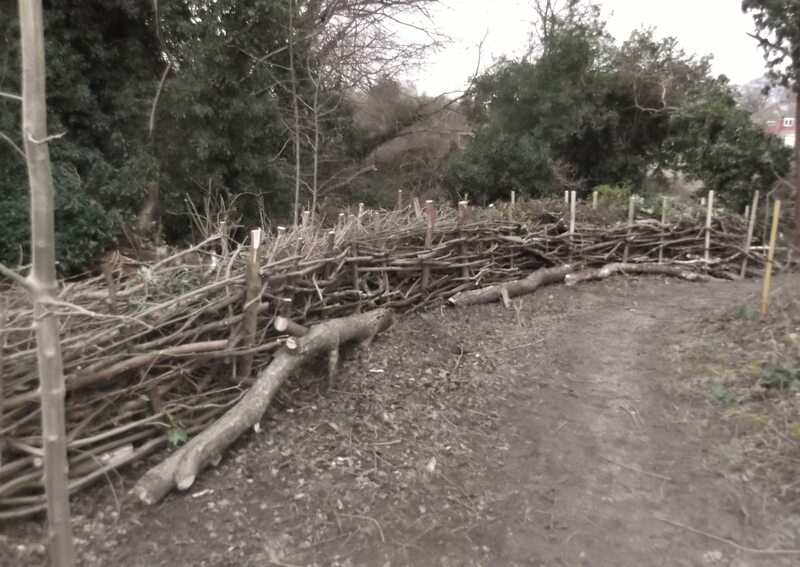 An alternative way of providing nesting habitats is the creation of dead-hedges. 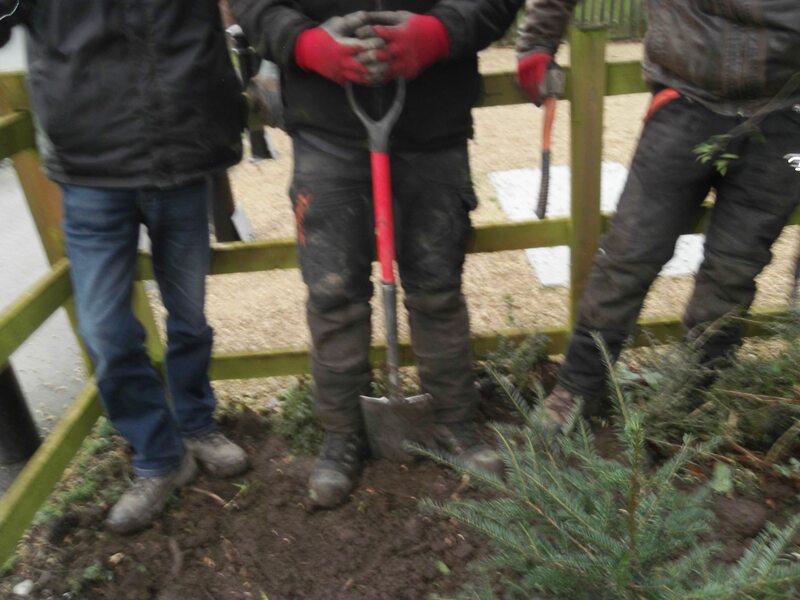 Mike, Dave, Adam and Malcolm started creating a south-facing dead hedge on 28th January from waste materials on the site. The hedge will also partially screen off the composting area. 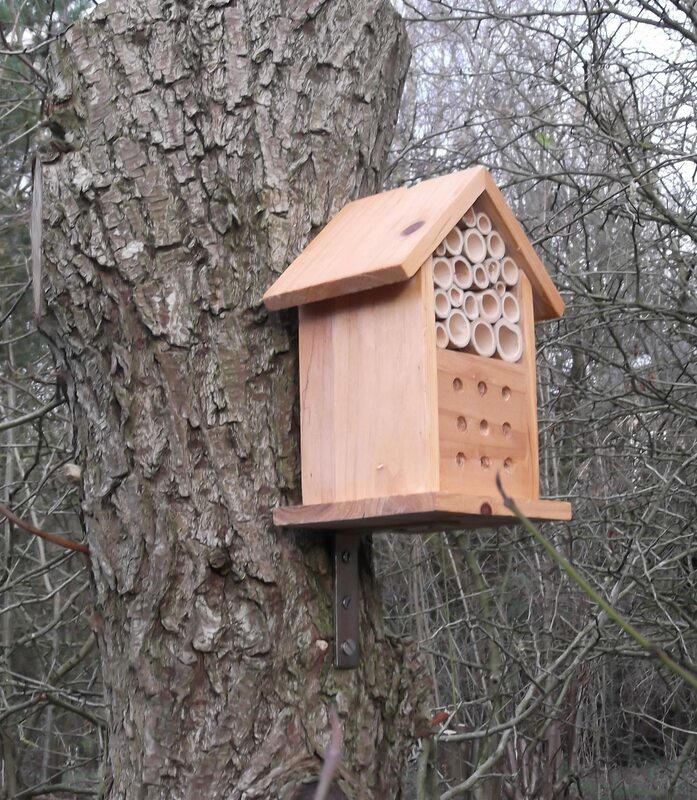 We took advantage of the mild weather on 27th Jan to put up a couple more insect hotels on the site. One is south facing and the other east facing so it will be interesting to compare occupancy later this year. 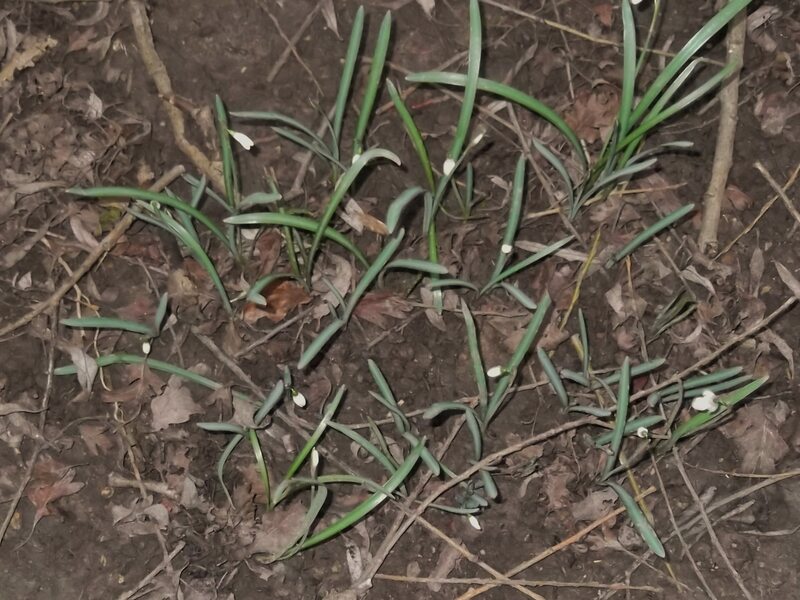 While checking distances on Jan 26th for MCT’s submission to Buglife, the fieldwork co-ordinator noticed that our snowdrops beside the path near Little Hob Moor (below left) are coming on well, but spotted a small clump doing even better behind the east bund (below right). 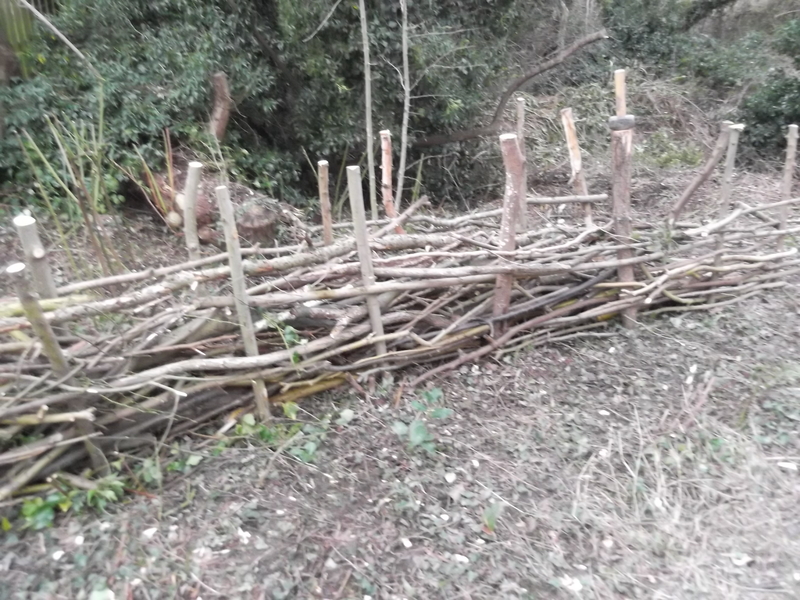 The observant regular site users may have noticed that on Thursday 21st Jan a lot of the ivy was removed by volunteers from two willows just beyond the north end of the west bund. This was necessary to assess tree health (it revealed bracket fungi on one) before trimming some of the branches shading young trees at the end of the bund that we want to grow on. MCT is making sure that a wide range of tree ages and types is being maintained on the site. Louise and Pam braved the cold on Sunday morning (17th Jan) to count over 700 trees looked after by MCT just on the west bund. There must be well,over 2 thousand on the site! They also did litter picking near the playground then and on the 24th. It does seem that the litter bin in the playground isn’t big enough as it couldn’t accommodate the 11 empty beer bottles they found nearby. 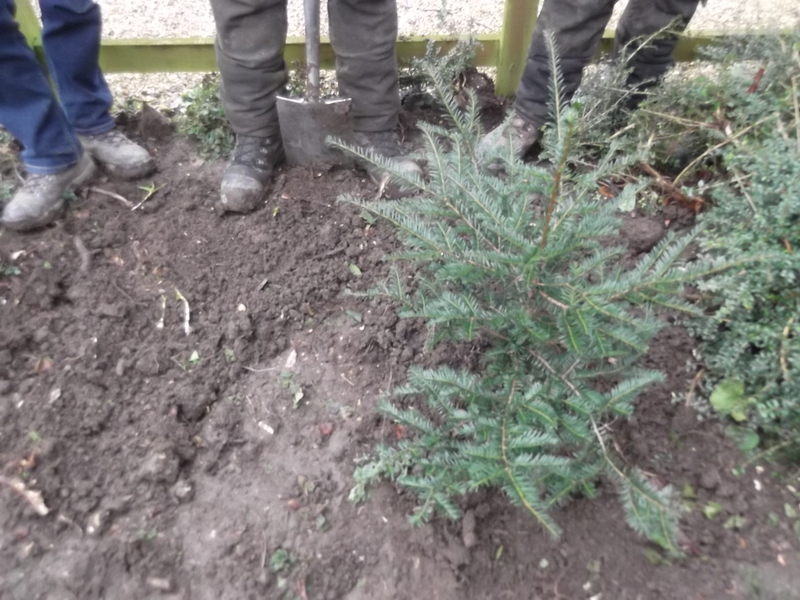 On 14th January 2016 four of our volunteers moved the Yew tree by the gate back a couple of feet to give it more room to grow in future years in response to a useful suggestion from Harvey Lowson, the CYC tree expert. As it does we’ll reduce the Elder behind it. The move involved digging out a couple of stubborn old tree roots first (see below). 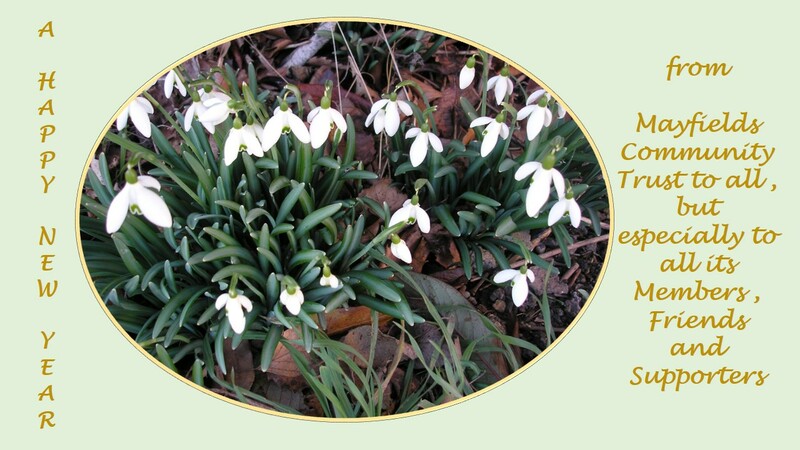 It was cold with flurries of snow, but the soil was still relatively appreciably warmer and not too wet, so it should be fine. A break in the weather on the morning of Sunday 10th January allowed Louise, Pam and Malcolm to spend an hour gathering up litter and disposing of it properly. Cans and bottles in (and round) the playground included a broken vodka bottle that needed careful collection for obvious reasons. 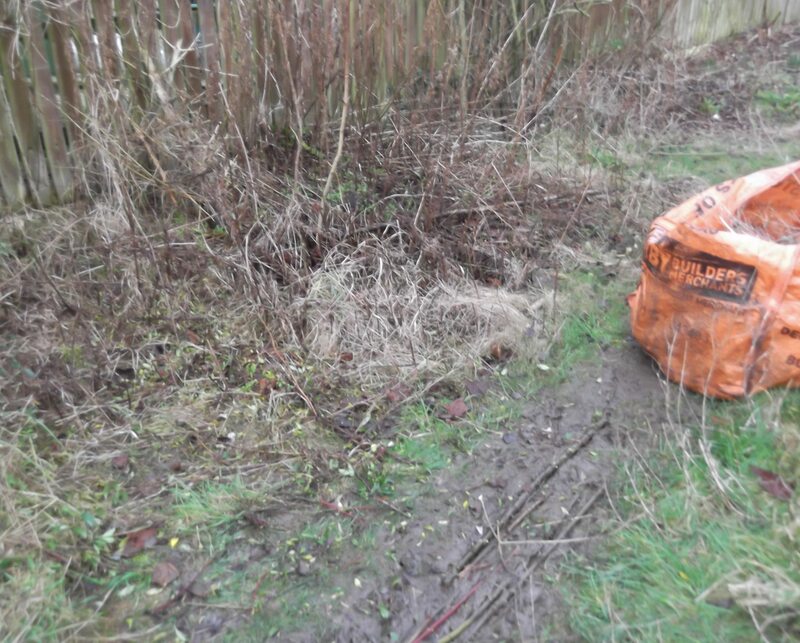 Almost as anti-social was the pile of very thorny garden prunings from a Pyracantha dumped beside the rear path; we cut them up, bagged them (as below) and put the material on the compost heap. 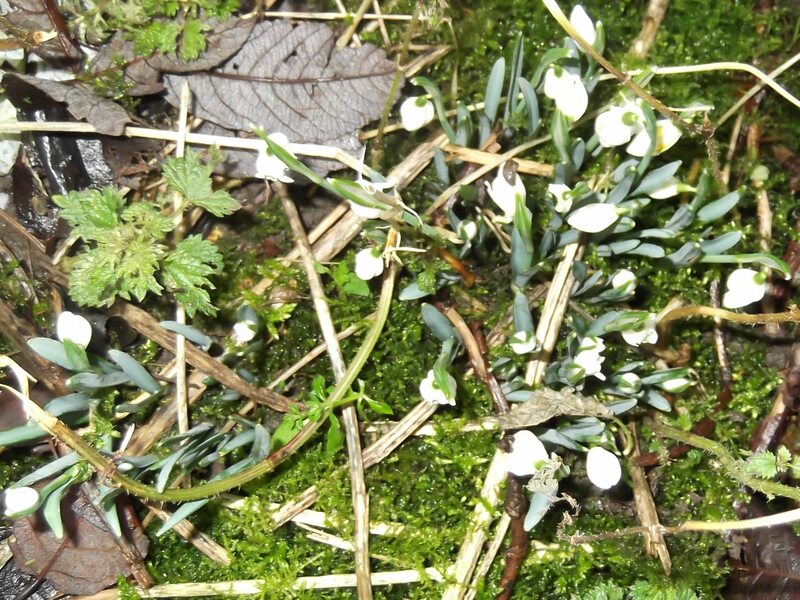 It was really encouraging to see buds starting to open on the snowdrops that our volunteers planted last Autumn beside the path at the Little Hob Moor end. 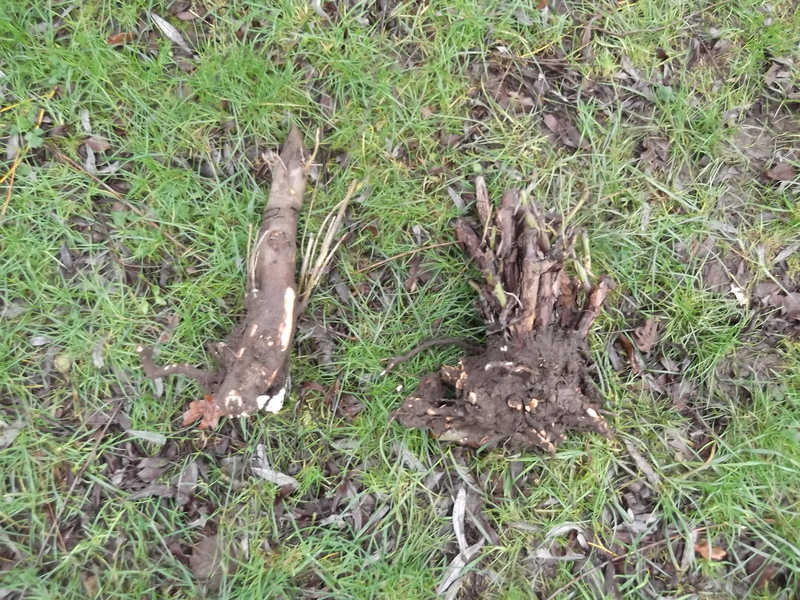 We spotted several when clearing twiggy litter off the path on January 3rd. Mind you, they need a bit more time to catch up with those on our New Year card!